1. Clean the vegetables, cut into pieces. 2. Boil water. Enter a subtle seasoning and bay leaf, lengkuas, tamarind and sugar Java until boiling again. 3. Enter the hard vegetables like peanuts and sweet corn. Cook until half cooked, then enter the other vegetables pumpkin, melinjo leaf and bean. Add salt and sugar to taste. 4. Cook until all cooked, lift. 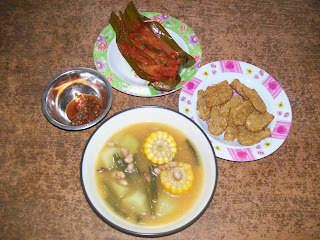 Suitable served with pepes tongkol, sambal terasi and tempe.